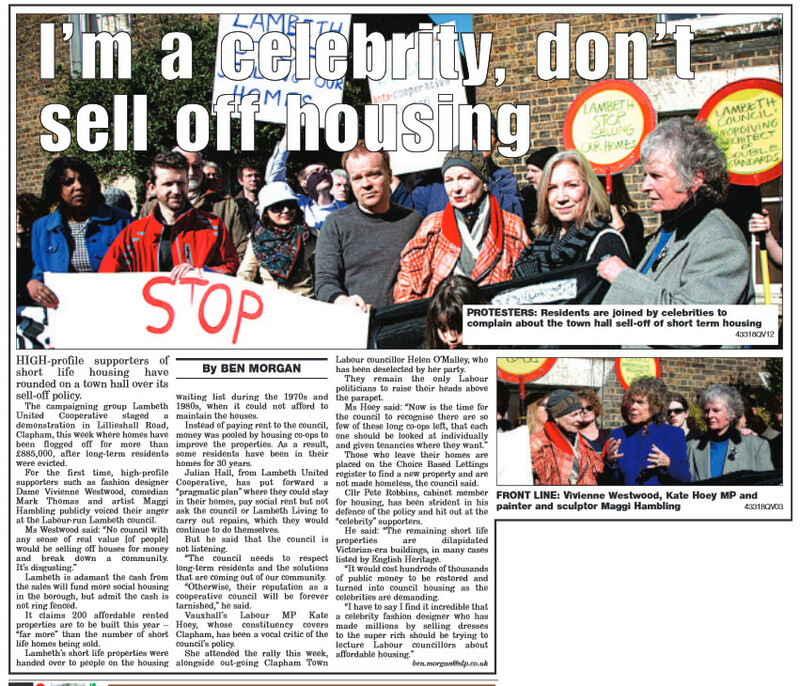 Congratulations to the Lambeth United Housing Cooperative for organising such a good photo call of celebrities and local supporters last Wednesday. 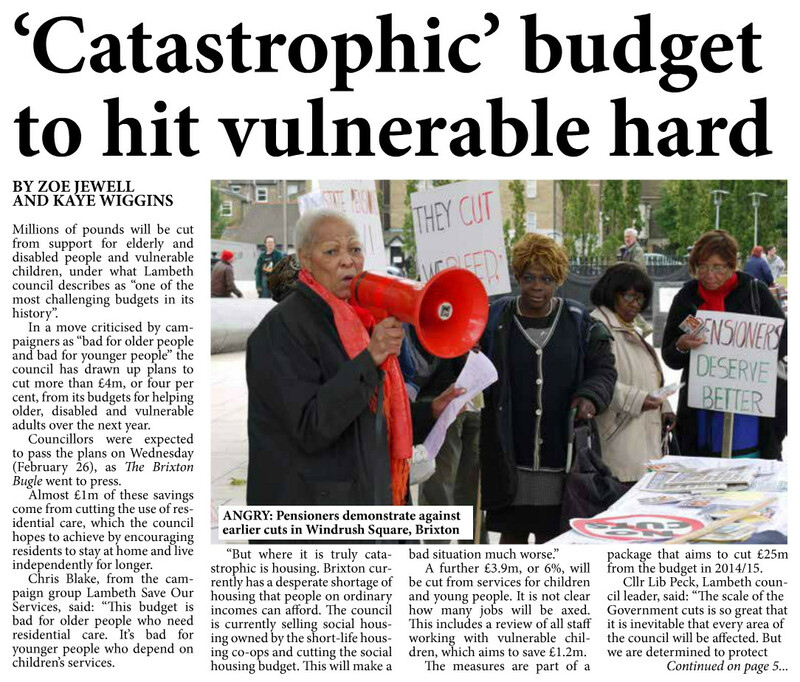 The turnout was good and the media attention was great, with a half page article in the South London Press. These articles raise some important issues. 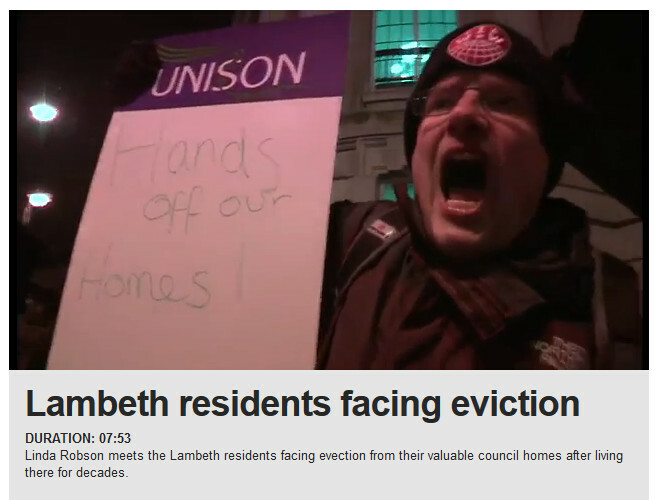 There’s a post on the Lambeth United Housing Co-operative website to discuss them. Thanks to everyone for making this day such a success. 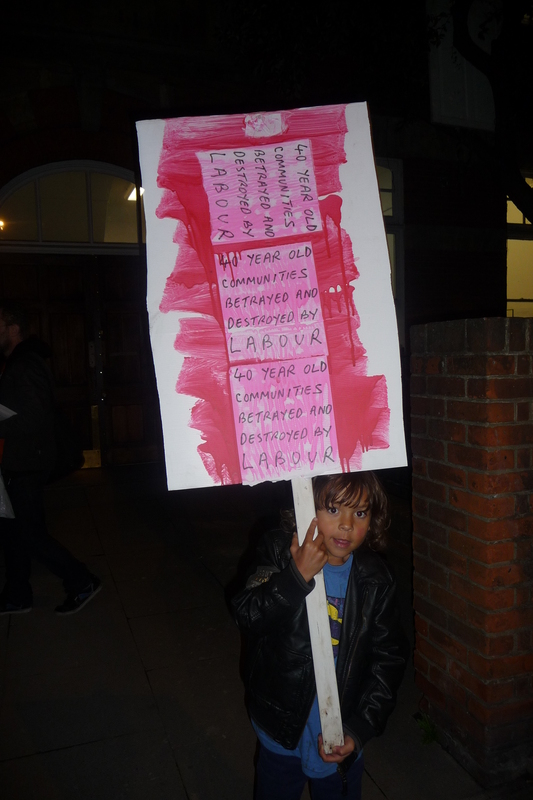 Photo call – Don’t Evict Martiza – Stop selling social housing in Lambeth! 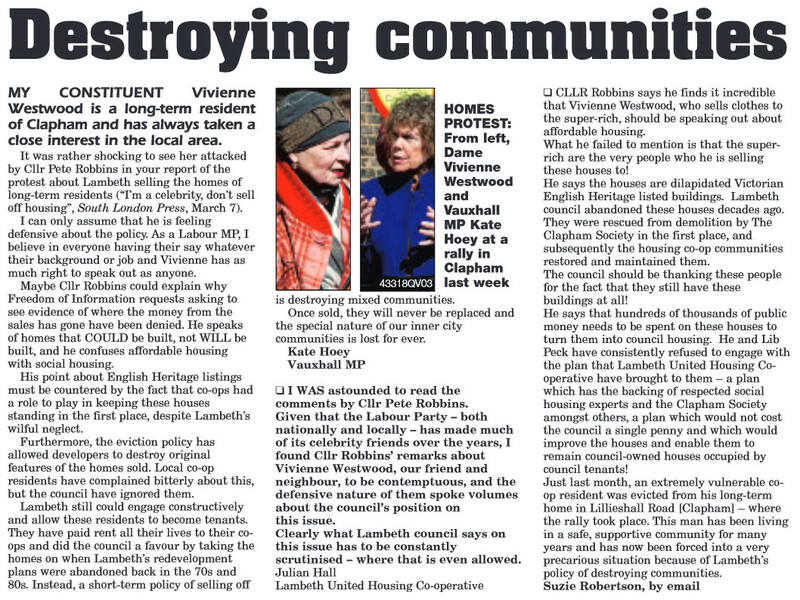 On Wednesday 5th March Lambeth residents and campaigners, including designer and activist Vivienne Westwood, comedian and activist Mark Thomas, artist Maggi Hambling and Kate Hoey MP, will meet in Lillieshall Road, London SW4 to protest against Lambeth Council’s sale of long-standing housing co-operatives. Can everyone please join us to show their support for Maritza and for the Lambeth United Housing Coop. It is really important we show how determined we are to campaign. 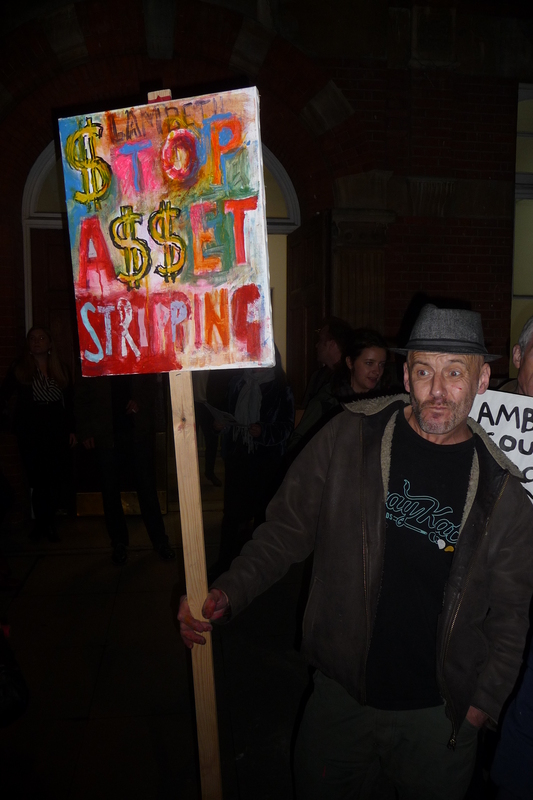 We’ve supported the Lambeth Housing Cooperative before and we stopped the eviction of Jimmy Rogers from his housing coop due to public pressure, we can do the same for Maritza too. We the undersigned pledge to stand with Maritza and her family when they refuse to leave their home, if Lambeth go through with their threat to send bailiffs to evict her in order to sell off the property. Maritza Tschepp and her family have lived in their home for 33 years. Their house was among those compulsory purchased by Lambeth for demolition for a couple of thousand pounds in the 1970s and left to rot. The council allowed ‘shortlife’ co-ops to be set up, run by the people like Maritza who were occupying and maintaining the houses. But Lambeth are now destroying these co-ops and selling off the properties with no acknowledgement of the blood, sweat and tears of the ‘short lifers’, who saved these homes from dereliction. At a time when waiting lists for council housing are at record levels it is a crime for Lambeth to sell social housing. Maritza has also invested in her community, setting up a local youth group and running it as an unpaid volunteer for over 20 years, but Lambeth has shown no concern about keeping people in homes and communities where they have lived and worked for so long. If Lambeth send bailiffs we will stand with Maritza to resist this unjust eviction. Don’t let ‘the Cooperative Council’ evict Maritza’s family from their housing co-op. Lambeth Council are organising a Leader’s Question Time this Thursday 16th January. The Lambeth United Housing Cooperative will be there putting questions about the Don’t Evict Maritza campaign. We urge all our supporters to join them. You can download publicity here. Please also sign the petition, and forward it to all your friends.